Decades ago, the term “supercar” referred to an exotic, limited-production automobile capable of achieving an ungodly top speed. Despite Joe Walsh’s claim in his 1978 song “Life’s Been Good,” no Maserati—and no other streetcar of the era—could reach 185 mph. But today, such velocity gets as little respect as Rodney Dangerfield. And quite a few sports cars (and even some big sedans) sail past 200 mph without breaking a sweat. Enter the new 2017 R8 V10 plus, the second-generation version of Audi’s groundbreaking design that debuted in 2006. It put Audi squarely in super-sports car circles and this iteration is the maker’s quickest, fastest production car to date. The new R8 has legitimate street cred: the car from which it is derived, the R8 LMS, is a formidable racer with multiple wins at grueling endurance venues like the 24 hours of Nürburgring and Daytona. Engine, chassis and about half the total parts used in the souped-up racecar are the same ones found in the production R8. Noteworthy is Audi’s SpaceFrame chassis, an aluminum and carbon-composite affair that is 40 percent stiffer than its predecessor’s. The body, 15 percent lighter, is all aluminum, and features an expansive rear glass window that artfully exposes the longitudinally mounted V10. Naturally, the R8 V10 plus begs comparison with the Lamborghini Huracán, as both share similar architecture, engines and near-identical specifications. Yet the cars couldn’t be more different in character and this is where the Audi shines as the more practical and understated of the two. The pair would make a fascinating garage duo, but if asked to choose the ideal companion to drive every day, the Audi R8 V10 plus is the car to beat. Eschewing tedious gullwing or scissor doors, the R8’s regular gates are a sensible way to slide into the comfortable interior and settle into the sport seats (optional race-style seats are available). Behind the flat-bottom steering wheel is a 12.3-inch, configurable TFT display that eliminates the distracting central-touchscreen of the past. Here, everything from tach and speedo to maps and entertainment are visible straight ahead, which results in one of the most uncluttered, aesthetically pleasing interior layouts around. The center console-mounted, rotary touch knob lets the driver use handwriting recognition for functions like navigation, radio and phone; a shortcut that helps keep eyes on the road. Audi audio partner Bang & Olufsen’s optional sound system ups the sonic ante, but may be superfluous for those more interested in a symphony via engine and exhaust notes. The most important functions, however, are controlled by both driver’s hands and right foot. The 7-speed S-tronic dual-clutch transmission is smooth, seamless and instantaneous. Paddle-shifting manually or in auto mode unleashes a rev-matched run through the gears, tuned by another rotary knob, which has settings for comfort, auto, dynamic and individual driving modes. On the other side of the hub is a “fun” button that opens up the exhaust system to unleash yet more sound and power. Handling dynamics are nearly telepathic; the car reads one’s mind like a good dance partner anticipates a step. Light on its feet but firmly planted, balance is enhanced by a mid-engine layout and relatively light 3,572-lb curb weight. The full-time Quattro all-wheel drive works as advertised and this Audi sticks like glue. It’s reassuring, to say the least. 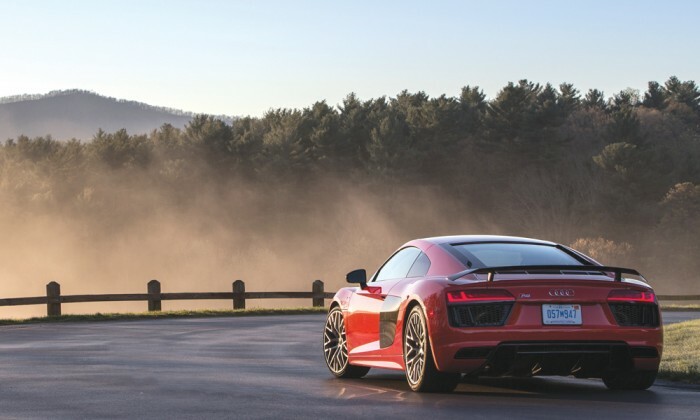 Adding to the confidence are carbon fiber brakes and 20-inch wheels that are as state-of-the-art as they are stylish (standard on the V10 plus and optional on the V10). 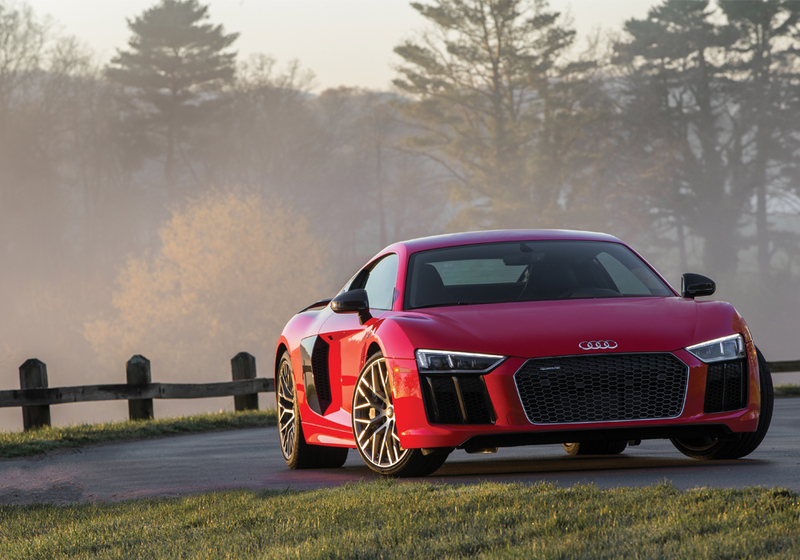 Neither a full homage to its predecessor nor simply a detuned production-version of a lauded racer, Audi’s newly minted R8 is its own understated beast, fit for daily rides and race-jaunts, if so desired. And at 10 grand less than its Lambo counterpart, it certainly earns the respect that Daingerfield so sorely sought after.